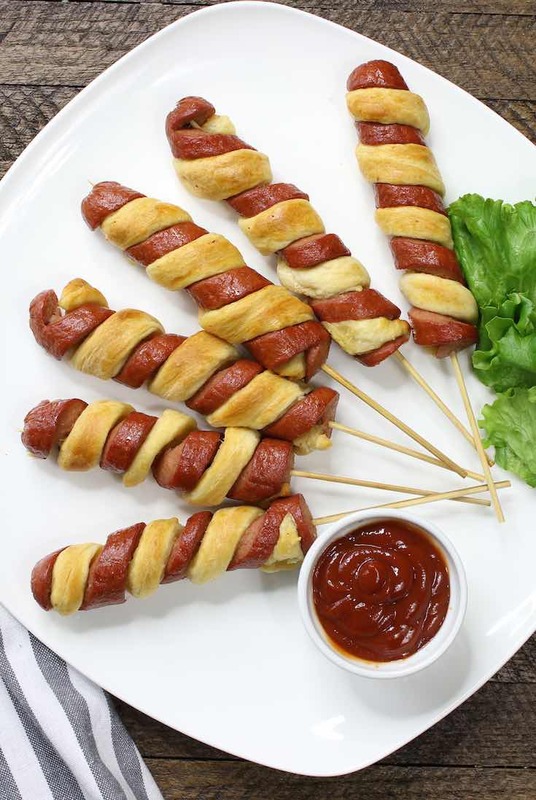 Crescent Roll Hot Dogs with a twist for a fun appetizer everyone will love, kids included! 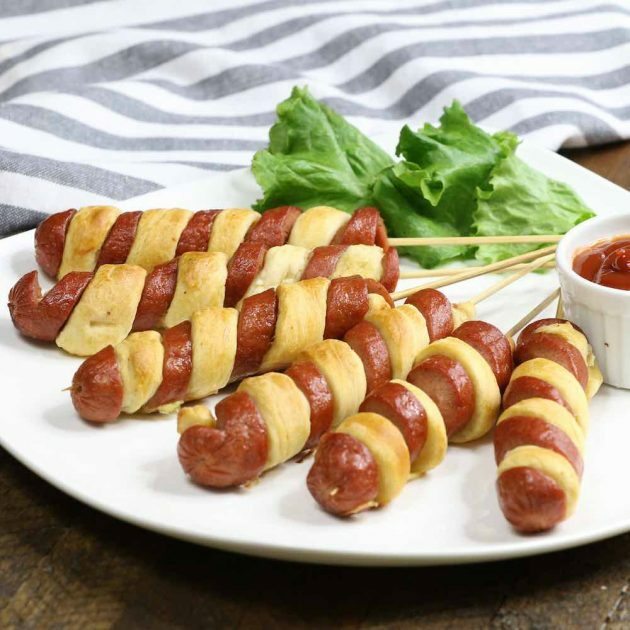 Served with your favorite dipping sauce, these crescent dogs are fabulous for parties, game days and birthdays.You only need 3 ingredients: hot dogs, crescent rolls, and egg wash. Plus video tutorial! Crescent dogs are always a crowd pleaser at parties. Just like with the classic pig in a blanket recipe, hot dogs are wrapped in crescent rolls and baked to golden perfection. For this recipe, we’ve woven them together for a stunning presentation. You can also go bite size by cutting the hot dogs into smaller pieces. Put them on toothpicks as mini crescent dogs you can serve as finger food for an irresistible hors d’oeuvre. People love to dipping them, so fill some cups with ketchup, mustard, salsa or your favorite condiments when serving. 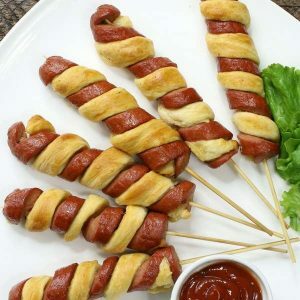 To make them, skewer a hot dog and use a paring knife to create a slit in a spiral pattern spaced about a 3/4-inch / 1 1/2-cm apart. Then pull the hot dog down the skewer to space it out. Roll out the dough with the palms of your hand into a 1/2-inch / 1-cm strip you can insert into the space along the spiral. The dough doesn’t need to fit perfectly because it will puff up while it bakes to fill out any imperfections (they’re sometimes called tornado dogs because of this whirlwind look!). 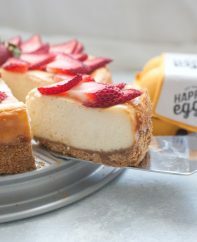 Brush lightly with egg wash and they’re ready to bake. Crescent roll hot dogs are easy to make ahead of time. 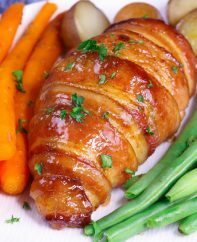 Store them in an airtight container in the fridge for up to 3 days or freeze for up to one month. Then reheat in the oven at 375°F (190°C) until hot. Keep the crescent roll dough refrigerated until use, as it will lose some of its puffiness at room temperature. This recipe will work with smoked sausages instead of hot dogs if you prefer. For a vegetarian option, simple substitute veggie dogs directly for hot dogs. 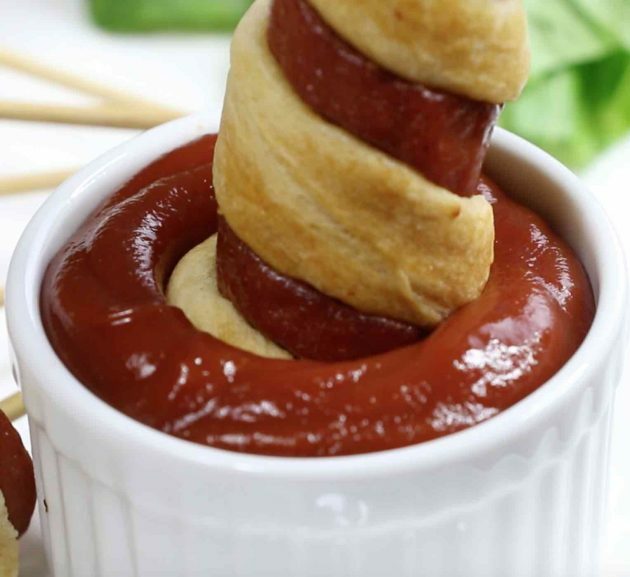 These Crescent Roll Hot Dogs with a twist make a fun appetizer that everyone loves! You only need 3 ingredients: hot dogs, crescent rolls, and egg wash. Served on skewers with your favorite dipping sauce, they're fabulous for parties, birthdays, Game Day and more. Plus video tutorial! Preheat oven to 375°F (190°C). 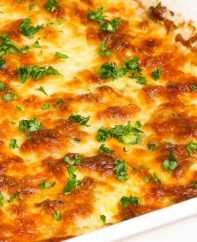 Line a baking sheet with parchment paper or a nonstick baking mat. Cut each hot dog in half width-wide into approx. 2-inch (5 cm) pieces). Push a skewer through the center of each hot dog piece. 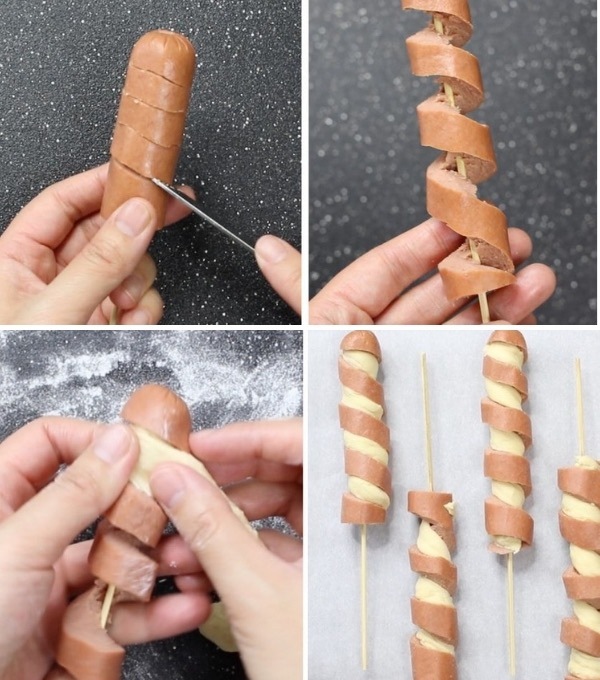 Slit each hot dog piece in a spiral pattern down the length of the skewer, spaced 3/4-inch (2 cm) apart. Then gently pull the hot dog down to make the slit into a 3/4-inch (2 cm) gap (refer to video). Break off some crescent roll dough and roll into a strip about 1/2-inch (1 cm) wide. Use it to fill the gaps on each skewer. Pillsbury crescent roll dough is only available in North America. If you live elsewhere, use refrigerated or frozen croissant dough instead. I didnt cut mine right but they were still good. Mine turned out like an octodog.